The economics of solar power have improved dramatically in recent years, thanks to improving efficiency and lower equipment costs. But all too many investors—including Wall Street analysts who should know better—have emphasized the growing adoption of the technology while glossing over the losses suffered by some of residential solar power’s main proponents. SolarCity Corp (NSDQ: SCTY), the brainchild of Paypal Holdings (NSDQ: PYPL) billionaire and Tesla Motors (NSDQ: TSLA) founder Elon Musk, has emerged as the nation’s leading developer of rooftop solar-power systems and has more than tripled its revenue since 2012. However, the company’s impressive sales growth hasn’t translated into profits. 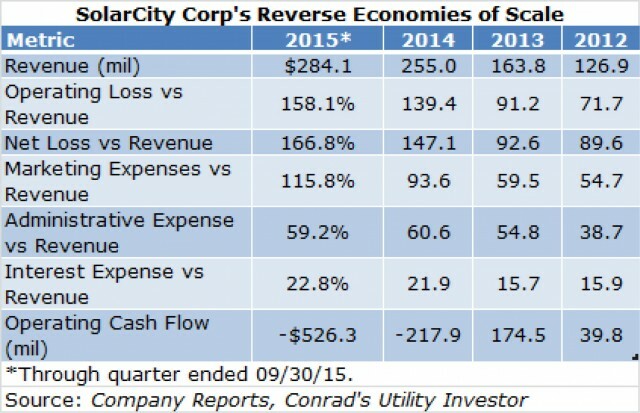 In fact, SolarCity’s losses have widened considerably since 2012. SolarCity’s fans—including 12 of the 18 Wall Street analysts who cover the stock—have brushed off the company’s lack of profits as a necessary cost of eventually achieving economies of scale. These backers cite falling component costs as evidence that the company continues to build scale, conveniently ignoring operating losses that have consistently increased as a percentage of total sales. System components aren’t the be all and end all of SolarCity’s cost structure; marketing, administrative and interest expense have also climbed since 2012. Bottom Line: Every incremental dollar SolarCity has made over the past four years has resulted in deeper operating losses and increasing debt and marketing expenses. These challenges drove the company’s more than $500 million shortfall in operating cash flow over the first nine months of the year. SolarCity bridged this gap by selling $783 million worth of long-term debt—more than three times its issuance in the first nine months of 2014. Mounting losses meant that the company eventually would have to change course. During SolarCity’s third-quarter earnings call, management pledged to slow its growth rate to narrow losses and preserve cash—an announcement that sent investors scurrying for the exits. 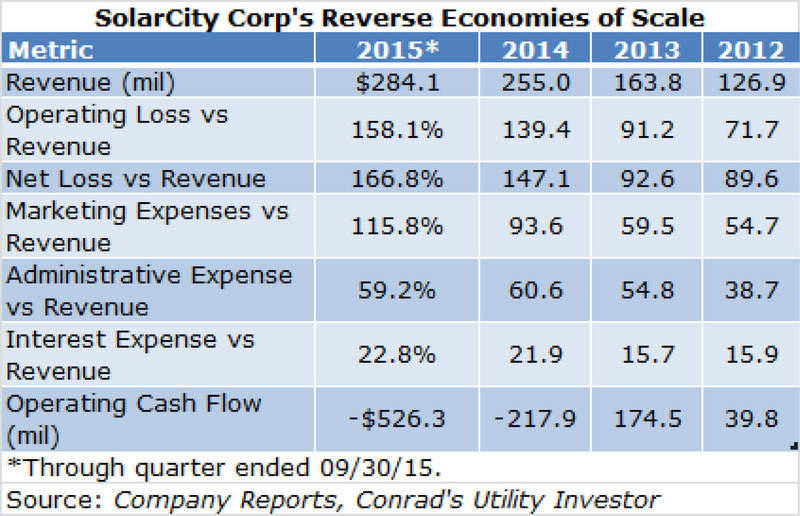 Can SolarCity survive? With the stock trading at an astronomical 8 times sales, the more important question is why any informed investor would risk sticking around to find out, especially when well-heeled utilities have entered the game. For example, half of Southern Company’s (NYSE: SO) third-quarter earnings growth came from utility-scale solar plants operated by its unregulated Southern Power unit. The company also plans to invest another $1.3 billion in solar in 2016—more than three times even the most optimistic estimate of SolarCity’s entire revenue base. Utility-scale solar power can deliver two to three times as much power as residential rooftop units at the same cost. Southern Company’s Georgia Power unit plans to develop both residential and utility-scale solar power as part of its rate base. Dominion Resources (NYSE: D), Duke Energy Corp (NYSE: DUK) and NextEra Energy (NYSE: NEE) have all announced similar plans. Although electric utilities may not receive as much media hype as SolarCity, these companies have several advantages over would-be disruptors: access to low-cost capital, reliable free cash flow from regulated businesses and existing customer relationships that reduce sales and marketing costs. The more a renewable-energy developer depends on outside capital, the more uncertain its prospects once the federal subsidies for solar power expire at the end of next year. The potential for oil and gas prices to remain lower for longer doesn’t help matters. Consider the recent turmoil in the yieldco space. Up until midyear, investors couldn’t get enough of yieldcos—a new generation of spin-off that offers a similar investment proposition to some master limited partnership (MLP), minus the tax advantages. Here’s how the structure works: The parent monetizes power-generating assets that operate under long-term contracts, selling them to the yieldco to drive dividend growth and price appreciation. This strategy provides the parent with access to low-cost capital to invest in additional growth projects. Many of these yieldcos focus on renewable energy. But investor sentiment toward the group has soured considerably, with the Bloomberg North America Power Yieldco Index giving up almost 36 percent of its value since the end of May 2015. Although the sponsors largely have lived up to their end of the bargain by selling assets to their yieldcos to fuel dividend growth, a number of factors have spooked investors, including concerns about rising interest rates and valuations that reflected unreasonable expectations—even if everything went according to plan. To worsen matters, the downdraft in most yieldcos’ share prices has increased these entities’ cost of equity capital significantly, raising questions about the economics of future drop-down transactions. Some sponsors have stepped up to the plate to limit the amount of equity that their yieldcos issue on the public market. For example, NextEra Energy pledged to purchase up to $700 million of NextEra Energy Partners LP’s (NYSE: NEP) common units to help fund the yieldco’s acquisition of privately held pipeline owner NET Midstream. Unfortunately, not every yieldco boasts a sponsor with the wherewithal to lend this level of support. Bottom Line: The improving economics of residential and utility-scale solar power create a significant growth opportunity for regulated electric utilities. That’s one of the key takeaways from the management teams I talked to at the first day of the Edison Electric Institute’s 50th Annual Financial Conference, the premier event for utility investors and industry insiders. 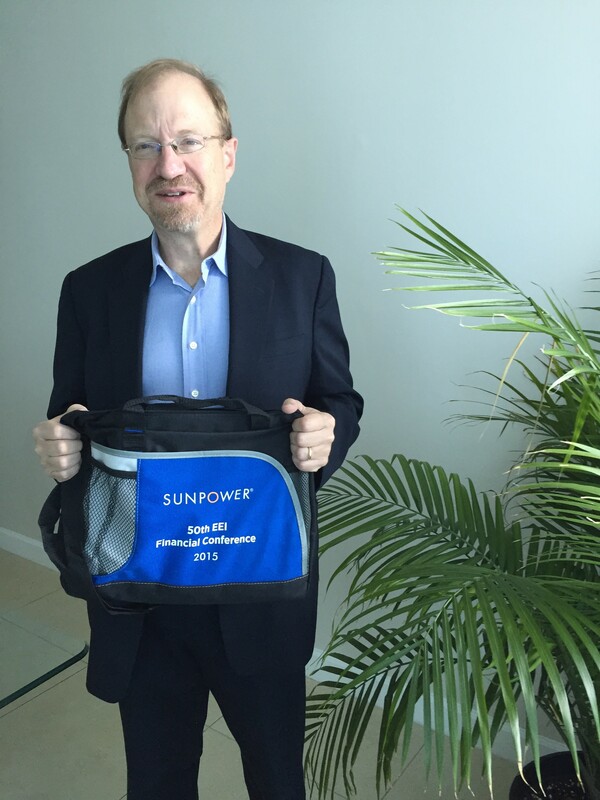 Against this backdrop, it’s no surprise that SunPower Corp (NSDQ: SPWR) has its logo emblazoned on the official bag distributed to conference attendees. Conrad’s Utility Investor subscribers can look forward to my exclusive video report on the conference, which will include insights gleaned from my conversations with management teams and my top utility stocks for 2016. Not a Conrad’s Utility Investor subscriber? Join today to make sure you don’t miss out on my exclusive video report from the Edison Electric Institute’s Financial Conference.